We're recreating Sigma Nu's history in photos and need your help! We’re dusting off old Sigma Nu photos and searching through Penn State archives and tapping into other sources to pick out some of the best from the past. Our fraternity has a proud history and tradition and a lot of it has been immortalized in photographs like these from the 1920s – a decade that saw plenty of expansion for Sigma Nu. From 1921 to 1927, eight chapters were established nationwide and we look back on the ’21, ’25 and ’27 classes with these photos! The Giving Season is Here, is Sigma Nu on your list? We’re almost halfway through our giving year and our annual fund totals are a bit behind where we were last year at this point. That means we’re on pace to finish below our total of $11,958 from last year. The good news is, it’s never too late to make a gift! So far, 34 Sigma Nu Brothers have stepped up and the average gift is about 100 dollars. Imagine if everyone chipped in – with 773 active alums in our database, we could raise upwards of 80,000 a year! Of course, this is ideal while current state is a bit different. Currently, our annual fund helps Sigma Nu in many ways. We have a full report on our 2015 Homecoming activities but are in need of your photos! Click here to submit them. We want to know...why is Sigma Nu still important to you? What have you been up to since graduation? What do you want your brothers to know about you? Click below to tell us all about it! Penn State's Anthony Zettel has played inspired football, literally. Read about how he's endured the loss of his father to become a driving force on Penn State's defense. Reception at Chapter House w/Open Bar (ID required), 5 - 7 p.m.
Buffet Dinner - 6 p.m. Annual Alumni Meeting - approximately 7 - 8 p.m.
Chapter Party - details TBD; likely to start at 10 p.m. (BYOB with ID check); click here for updates. Budgeting and Planning Meeting with Active Chapter: 1/24 beginning at 11 a.m.
Blue-White Game Buffet Dinner: 4/16 at 6:30 p.m.
Alumni/Active Work Day: 4/23 beginning at 10:30 a.m.
Arts Fest Lunch Time Cookout: 7/16 beginning at 11:30 a.m.
Like the bonds we forged in Sigma Nu, Penn State football players share a special camaraderie in their own. Turn on almost any NFL team’s game on Sundays – or Mondays or Thursdays – and you’ll find that Nittany Lion football brotherhood strongly represented. We want to take another opportunity to thank all the brothers who gave to our annual fund this past year. Our giving year wrapped up in July and we’re in the third month of our annual giving campaign. We’re happy to report that we are on pace to reach raise a total close to the $11,958 we raised last year when 98 brothers answered the bell for Sigma Nu! But with more than 775 active alums who’ve shared the Sigma Nu experience over the years, we think we can do better! Over the last four decades, the American elm trees on the Penn State campus have dwindled. In 2014, another elm was removed from behind our Chapter House after other trees were brought down due to Dutch elm disease in the past. It wasn’t just a problem specific to our property. Since the mid 80’s, Penn State’s American elm population has gone from just under 300 trees to less than 100. From 2007 to 2010 alone, Penn State’s campus lost 208 elms alone. A full photo gallery is up on our website (you must be logged in to see them) of the removal of one of our elm’s last year and we’re wondering – do you have any stories about the elms? Share them in the comments below or email travis@affinityconnection.com. The college football season is just around the corner, meaning it’s nearly time for Sigma Nu Brothers to pull out their blue and white jerseys and other Penn State football gear in preparation for Penn State’s second season under head coach James Franklin. It also means it’s time to start taking a look at where the Nittany Lions stand with training camp looming. Send us your Alumni updates! As many of you know, an unfortunate set of circumstances caused water damage to the Chapter House and resulting repairs forced us to cancel our reunion dinner last month. Importantly – it cost many Sig Nu Brothers and their families an opportunity to catch up in person. The next best way to do that, with everyone spread out, is to communicate digitally! So what are you up to? Got good news you wanted to share with the Brotherhood at the reunion but couldn’t? Looking for information or wondering about an old friend? Click below to share your news with your brothers! One Month Left, Let’s Finish Strong! When it comes to giving back to the fraternity that helped shape many of us, Sigma Nu brothers have stepped up considerably this year. Not only are we nearing our goals to up our donations and broaden our donor pool, we are getting close to a record-setting year for giving back! And while we’re close to our goal, we’re also nearing the end of our giving year. Read more to see how you can help. Check Out This Greek Sing Video We Found! Who doesn’t love a little Greek Sing? Greek Sing is a favorite of many, and for those of you who are fans of it, we have a treat for you! Penn State IFC has so graciously posted all of the Greek Sing 2014 videos to YouTube for any and all to enjoy! We found Sigma Nu’s performance in which they partnered with both Phi Mu and Phi Kappa Sigma to put on a lovely performance of the ever-famous Cinderella! Read more to check it out. If you are planning to make a trip back to Penn State this spring or summer, grab your friends and check out two new hot spots that are new to the Happy Valley scene. In mid-February freezing in the sprinkler system at the Chapter House caused extensive damage that will cost upwards of $60,000 to repair. Work is ongoing. To find out how you can help, read on! After providing esthetics and shade for many years, our big elm tree at the north end of the house — a victim of Dutch Elm disease — came down on Monday, Nov. 24. Click below to read more about this sad day in the history of Delta Delta. Join us at the chapter house from 11:00 a.m. to 1:00 p.m. on Saturday, January 24, to review and finalize budgets for the Active Chapter and schedule/plan alumni events for the remainder of the academic year. We will meet in the Chapter House dining room, and lunch will be provided. All alumni are welcome to attend. Click below to see the full agenda. We recently sent out a survey asking for alumni feedback on several aspects of our alumni relations program. We anxiously awaited the incoming of your results. We haven’t slept in days, the fridge has run barren and we’re reduced to eating nothing but ramen (sounds like freshman year, right?). Okay, well maybe not that extreme. But we were eager to see what you had to say!! As Brother Doug Kosydar ΔΔ1249steps down as worthy commander, he challenges each of us to "reach out to a brother from a previous decade, a brother that joined after you and a member of the active chapter. Make a connection. You never know where that bond may lead you. Remember: life is short, time is precious and these relationships are priceless." Click below for Doug's closing letter. Click below for a few house updates from this year's Sigma Nu House Corporation Officer of the year, Brother Robert A. (Nellie) Nelson ΔΔ916, President, Delta Delta Property Association. Our undergraduates began the fall 2014 semester on the heels of the 65th Annual Grand Chapter which was held in Nashville, Tenn., over the weekend of July 16-20. During this week, our undergraduate brothers were recognized by national with two awards: 2014 Manpower Award (given to chapters who have achieved a manpower of above 80 men) and the 2014 25% Increase in Manpower Award (given to the chapters who have achieved a 25% increase in manpower from the previous year). And the trend continues through the chapter’s focus on scholarship, recruitment, philanthropy and campus participation. Click below to read more. Who’s Behind All Those Heinz Products? Meet Our New Worthy Commander! It was a hard-fought battle by the Nittany Lions on Saturday, Sept. 27. And while the Northwestern Wildcats stole Penn State’s Homecoming football victory, our Delta Delta brothers were not about to let a loss spoil the opportunity to return to the chapter house and reconnect with fellow brothers. You may have put your Homecoming 2014 memories behind you already, but we want to keep the spirit of the weekend alive. Specifically, we want to see your photos from the weekend. The best photo will be featured on our website home page later this month. Click below for details. Want Better Seats at Beaver Stadium This Fall? We are pleased to announce that this year we have access to some new Beaver Stadium pricing options for alumni, allowing us to attend games in blocked seating exclusive to Sigma Nu alumni, family and friends. Click below for pricing and contact details. Tell us your best and greatest Rathskeller memory. Email it to content@affinityconnection.com and we'll use your story in the next eletter! C'mon, you know you will enjoy sharing these and reading other brothers' stories! Where Does Sigma Nu Fit Into Your Life? It’s 2014. How many years since you passed out of the halls of 340 N. Burrowes and into your present set of circumstances? Did you leave Sigma Nu behind? Or, did you “cling to the visions of our youth, thinking of [the Fraternity] as creative force for the spiritual development of men, whose lives it shall dedicate to Love, glorify with Honor, and conquer for Truth”? As we kick off our 2014-15 giving year, we ask all of our Delta Delta brothers to remember what Sigma Nu means to them and to rededicate themselves to those values of love, honor and truth. Click below to make your gift today. Delta Delta Chapter sends its condolences to the friends and family of Brother Joseph E. Hyson ΔΔ0708. Joe passed away on July 2, 2014, in East Chatham, N.Y., after a long illness. He was a 1958 graduate with a B.S. degree and member of the Business School Honor Society. His late wife was Ginger Hance '57 EDU; they had four children. His business career was that of an aluminum products manufacturers representative. At Sigma Nu, he was an "all time great Social Chairman." Joe and Brother Will Snell ΔΔ0664 won the Horseshoe IFC championship. Click below to access his full obituary. As Arts Fest quickly approaches, we want to update you on a few things happening at the house and around State College. Thanks to Brother Ed Sidwell '58, we have a firsthand description and photos of the new gas line going in at the house. Click below to read more. We are honored to announce that Brother Robert Nelson ΔΔ0916 has been named the Housing Corporation Officer of the Year by Sigma Nu National. Click below to read more about Nellie's award and to send him your congratulations. Since July 1, 2013, we have received $10,306 from 93 alumni toward our 2013-14 Annual Fund goal of $10,000. This is 103% of our goal. Thank you to all brothers who stood behind their pledge to help sustain the chapter for generations to come. We have less than three weeks left in this giving year. Click below to see the names of our recent donors and to find out how you can make your gift. We are extremely saddened to report the passing of Brother William "Bill" Coale ΔΔ0695. "I had the distinct honor of being in Bill's presence several times due to working on our capital campaign as well at our golf outings," explains Worthy Commander Doug Kosydar ΔΔ1249. "Bill taught me many things during our conversations and he was an inspiration to me. His legacy will not be forgotten." Click below to reach more about the life of Brother Bill Coale, and be sure to log in to leave comments and share your memories. Thanks to the craftsmanship of Brother John Odonnell ΔΔ869, this bronze plaque now has a new backing and can be placed in the foyer of the Chapter House. It now measures 16 inches high by 20 inches wide. There will be a donation plate affixed to it before it's hung, and we are thinking of hanging it between the coat closet and the entry to the Chapter House. As you think about Sigma Nu at Penn State and the value in being a part of this organization, what are your favorite things? What motivates you to give to your brotherhood? We have come up with our own list of reasons to stay connected, support the chapter and help us return to our glory days. Click below to see our Delta Delta Top 10. Then send us your own Top 10. Thank You to the Work Day Helping Hands! Thank you to all of the helping hands who spent Sunday, April 6, at the house in preparation for Blue-White Weekend. Click below for the link to more photos. It is a scene like none other. For those of you who have been part of THONs past, you know. Click below to read about Delta Delta's contribution to the largest student-run philanthropy effort in the world. Congratulations to the Active Chapter for delivering an overall GPA of 3.13 for the fall 2013 semester and receiving recognition as one of the Penn State Greek organizations in "Good Academic Standing." The Delta Delta Chapter of Sigma Nu learned recently that Gerald Keith Twigger '77 (ΔΔ1015) of Churchton, Md., died unexpectedly at home on December 19, 2013. He was born April 5, 1955, to Jerry and Jane Twigger who are predeceased. His aunt Susie Balsinger still resides in the Uniontown, Pa., area. On Wednesday, Dec. 11, the Greek community at Penn State held their annual holiday house lighting competition. The Sigma Nu house looked great this year with the snow creating a winter landscape. Congratulations to Sigma Pi, Sigma Alpha Epsilon, Alpha Sigma Pi and Phi Gamma Delta for their award-winning displays. We are sending you another edition of our semester newsletter. The actives are excited to announce that the Delta Delta Chapter of The Legion of Honor is continuing its success from the spring. Not only are more and more young men taking the oath of a Knight, but also each member is taking that oath to heart and striving to improve our chapter every day. Our success is enabled through alumni support. Thank you for your continued support. Your example continues to inspire us and your devotion humbles us. Love, Honor, Truth. We would like to take this opportunity to reflect on the life and achievements of Brother Charles Vance McCullough '66 (ΔΔ0813). Brother McCullough passed away unexpectedly on August 19, 2013. An two-time Penn State graduate and accomplished Army captain with recognition as Penn State's "Fly Fishing Professor," McCullough will be missed by many. Please take a few minutes to read his obituary (link below) and to share your thoughts on our Facebook link. The President of the Property Association, Brother Bob Nelson, called the annual Homecoming meeting of the Delta Delta Alumni Chapter and the Delta Delta Property Association of Sigma Nu Fraternity to order. The meeting was convened at 11:00 AM in the Chapter Room of the Chapter House. Brother Nelson determined that a quorum was present as required by the Association's Bylaws. Introductions followed a brief welcome by Brother Nelson and recitation of the Creed. The meeting agenda is provided as Enclosure 1. The Eminent Commander, Brother George Bonnewell, reported on the highly successful recruitment efforts over the last year. The Chapter received two related awards from the General Fraternity for a 25% increase in manpower and a 10% Challenge Award for increases in the size of the candidate classes. He reported two successes in intramural sports – a championship in bocce ball and semi-final finish in softball. The alumni congratulated the Collegiate Chapter. The report of the previous meeting, held on October 6, 2012, was approved as read by Brother Nelson. Brother Nelson was the only officer of the Alumni Chapter (Recorder) present at the meeting. He presented and briefly discussed the Alumni Chapter financial statements dated September 30, 2013 (Enclosure 2). He reported that the Worthy Commander, Doug Kosydar wished to step down from that position and noted the opportunity to assume that position would occur during the elections portion of the meeting. Brother Nelson discussed his annual report dated August 11, 2013, focusing on delinquent pledges. An electronic version of the annual report is available on the alumni web site (www.sigmanu-psu.org). His discussion summarized information contained in the Capital Campaign portion of that report. Brother Nelson reported that the following steps & strategy are being implemented to close out collections. 1. Mail fall pledge reminders only to those individuals who have made a pledge contribution in the last two years. Prepare list of these individuals & monitor returns from this group. 2. Prepare list with contact info of those who have made no donations towards their pledge commitments. 3. For those not included in Categories 1 & 2, prepare list with: (1) all contact info; (2) pledge amount; (3) total donated to date; & (4) date of last donation. Continue pledge reminders for those in Cat 1. Consider writing off Cat 2 with a letter informing them of this action. For Cat 3, volunteers will call the brother asking for a recommitment to his pledge. Brothers Jim Shincovich and Lane Kintigh volunteered to assist in these efforts. Brother Nelson distributed a map and schedule for the installation of a new natural gas pipeline that will supply natural gas to the university's steam plant. He noted that there should be little impact on the chapter property and operations. Brother Nelson summarized the three somewhat conflicting assessments of the condition of the House Mother's Suite exterior walls. He plans for a final assessment this spring at which time options will be formulated for review by the Board of Directors. Finally, Brother Nelson distributed and briefly discussed the financial statements for the Property Association dated September 30, 2013 (Enclosure 2). He noted that maintenance and repair expenses have been unusually high because of the elm tree removal and the repair to the north chimney. In response to a question, Brother Sidwell discussed the legal actions that would be needed to remove from our deed the university's right of first refusal to acquire the property if the chapter ever loses its charter. Certificates of Appreciation were presented to alumni: Doug Kosydar, ΔΔ1249; Ed Sidwell, ΔΔ879; Jim Wyland, ΔΔ1273; Jim Shincovich, ΔΔ860; and Karen and Michael Sweeney, ΔΔ1220. A certificate was also presented to the Collegiate Chapter's Eminent Commander, George Bonnewell, ΔΔ1490, for his outstanding leadership over the past year. Brother Nelson informed the attendees of a gift planned by brothers from 1955 – 1956. They have raised $1000 - $1200 and are seeking suggestions on how these funds can be used to memorialize/honor the class. Brother Nelson described the suggestions he had received from alumni. No further suggestions were presented at the meeting. However, Brother Bonnewell stated that the Collegiate Chapter would provide suggestions. During this portion of the meeting, Brother Bonnewell discussed the need for improved communications between the Collegiate Chapter and the Property Association. All agreed that this was necessary. Other than elections, there was no further business presented. Brothers Lane Kintigh, Jon Stavinski, and Brent Potter were elected as Directors of the Association for a three-year term. There was no further business presented and the meeting was adjourned at approximately 12 AM. To report on the status of the alumni organizations, discuss plans for the current academic year, conduct business as it may be properly brought forward before the organizations, and elect officers and directors for the next year. This annual report was prepared and is submitted by the President of the Delta Delta Property Association of Sigma Nu Fraternity (“the Association”) as required by Article VI of the Association’s Bylaws. The period of this report is from July 1, 2012, through June 30, 2013, unless otherwise stated. On September 1, 2013, representatives of the Property Association and the Alumni Advisory Board met with officers of the Collegiate Chapter for the annual Kick-Off Meeting. Important notice to alumni: please do not park in the chapter lot or your car might be towed! Penn State's new students will arrive on campus Friday-Saturday, August 23-24, which means fall recruitment is right around the corner. Get the jump on recruiting with this sneak-peak preview of Penn State's Fraternity Guide, not scheduled to hit campus for another week yet, and to see how Delta Delta is represented! Thank you to Mike and Karen Sweeney for their generous donation to help fund the kitchen upgrade at the Chapter house. Below is the note from Brother Bob Nelson. On behalf of the entire Delta Delta Chapter, I thank-you for your generous donation to help fund the kitchen upgrades. As you stated in your letter, it is truly encouraging to see the collegiate chapter return to the tradition of dining together. This week I'll approve the proposal for the new dishwashing machine (www.cmadishmachines.com/cma-est-ah.html). I expect that it will be installed in late June or early July. The dishwasher ventilation exhaust duct must be repaired and we need to swap the location of the two refrigerators. Work orders have been placed for both jobs. Working with Nittany Co-Op and our food vendor CollegeFresh (www.collegefresh.net), we've prepared an inventory of needed dishes, cups, mugs, pots, pans, flatware and utensils. We'll order these items in the next few weeks. I early August, Ed Sidwell and I will meet with the representative from CollegeFresh to review our preparations and order additional materials, as needed. The kitchen was professionally cleaned after the spring semester and the summer residents are going a great job of keeping it clean. With all of these preparations, we should be ready to cook when the guys return in late August. Again – we greatly appreciate your donation. I trust that all is well with your family. The Chapter house will be closed to all brothers except for the summer residents during this years festival of the arts. Share your thoughts on our message board. This board is password protected and accessible only by Sigma Nu alumni. In an effort to reconstruct a comprehensive Delta Delta chapter family tree, I have created a short form to gather information. The tree cannot be completed without your help. Please provide as much information as you can remember, and be as accurate as possible. Because every member has a Big Brother, we should be able to reach all the way back to our founding fathers. Thank you in advance for your help! This annual report was prepared and is submitted by the President of the Delta Delta Property Association of Sigma Nu Fraternity ("the Association") as required by Article VI of the Association's Bylaws. The period of this report is from July 1, 2011, through June 30, 2012. Representatives of the Association, Alumni Chapter, and Alumni Advisory Board (AAB) met with the leadership of the Collegiate Chapter at a "kick-off" meeting on September 4, 2011. The fall budget was reviewed and plans for the fall semester were finalized. The annual meeting of the Chapter's alumni organizations was held on October 15, 2011. In addition to normal discussion topics and alumni officer elections, the meeting included a status report on the capital campaign donations and capital improvement plans. Officers and Directors of the Association and Alumni Chapter held a budgeting and planning meeting with the Collegiate Chapter on January 28, 2012, at which time the Association's draft budget for the next fiscal year was presented and discussed and the Collegiate Chapter's budget for the following academic year was developed. The results of this meeting are documented in a letter from me to the Eminent Commander dated February 3, 2012. After the meeting, the Chapter voted to scrap the two-tier out-of-house fee adopted the previous year. It was replaced by a single fee $500 regardless of compliance with the Chapter House Residency Policy. The Chapter made this decision after I had provided a detailed explanation of costs that supported a significantly higher fee. Apparently, the Chapter is willing to significantly subsidize out of house brothers in order to preserve the option of violating the Chapter House Residency Policy and moving out without a financial consequence. Our "Building a New Legacy" campaign concluded on January 31, 2008. We received a total of 170 pledges with a total amount pledged of $297,423, well short of our goal of $600,000. As of the date of this annual report, a total of $231,008 had been donated, leaving an uncollected balance of $66,465. Of this balance, $32,950 is owed by the Classes of 2007 – 2012, for which some collections have only recently been initiated. Actual donations are lagging behind pledge commitments in the amount of $27,155. Some related statistics follow. The total delinquency has varied from $7,000 in June of 2008; $22,600 in June of 2009; $30,520 in June of 2010; and $24,020 in June of 2011. In the summer of 2008, we sent special letters to those individuals who were behind in their commitments with little success in increased collections. $16,195 was donated this fiscal year. Affinity Connection has been retained to process pledge reminders, collect donations, and prepare monthly reports. The Affinity costs for this fiscal year totaled $5,184. I'm concerned about the high cost/collection ratio of approximately 32%. I plan to meet with Affinity before the academic year begins to discuss the situation and measures we could take to improve collections and reduce collection expenses. In May of 2012, the Board approved replacement of the tile floor in the basement from the door to the north party south through the south party room. This project included the removal of the existing asbestos containing tile, repair of the underlying concrete floor, and installation of new tile and baseboard. As of the date of this report, contractors had been selected but the project was not scheduled for completion until July. As of the date of this report, the Board had no other large-scale capital project proposals formally under consideration. However, I had initiated work on a new project proposal to be submitted to the Board in July 2012. Brother Sidwell continues to serve as our principal point of contact with the Office of Fraternity and Sorority Life. He also covers the Advisor Meetings when our advisors have conflicts. .
For the 14th year, Brother Sidwell served on the Board of Directors of the Nittany Cooperative, formerly the Fraternity Purchasing Association. Brother Sidwell's interactions have reaped benefits in a variety of ways. Besides keeping us "plugged in" with all aspects of the Greek community, Brother Sidwell's efforts have resulted in significant financial benefits. For example, Brother Sidwell interfaced with the university in preparation for sidewalk improvements along Borrowes Road. In addition, because of his contacts, the Association was successful in acquiring a used commercial style double door refrigerator at a cost of only $500. In addition to the above repairs, security deposits were debited in the amount of $1,356 for repairs due to damages caused by the Collegiate Chapter this fiscal year. This amount contrasts to $5,693 debited for damages caused in the previous fiscal year. After over a decade, in-house meals returned to the Chapter House in the fall. After looking into several alternatives, the Chapter selected Harrison's Wine Grill and Catering (the restaurant at the Hilton Garden Inn), through its "Greek Eats" program, to provide a catered meal plan serving lunch Monday through Friday and dinner Monday through Thursday. All meals were served buffet style. However, at our winter Budgeting and Planning Meeting, the Chapter reported broad dissatisfaction with the catered meals. Ultimately, it was decided to discontinue catered meals for the next academic year. Unlike past years, we had few problems with bursar billing this fiscal year. The university does not bill for the summer semester so this burden normally falls on me. However, because of liability issues the past two summers (discussed in last year's annual report), the Board had decided to close the Chapter House for the summer of 2011. This decision was revisited in the spring 2012 because several brothers needed a local residence for the summer and I handled the billing and collections. A contract modification was negotiated and 11 brothers signed up for summer residency. Completing the required paperwork for bursar billing remains a headache. The university establishes strict deadlines, and if not met, bursar billing is not possible. Both Ed Sidwell and I have had to work very closely with the Collegiate Chapter treasurer to ensure that the needed forms and spreadsheet are complete, accurate, and submitted on-time. The Chapter failed to submit some of the required paperwork for the fall 2012 necessitating some last minute work. At the end of the spring semester, three brothers had overdue accounts. Brother Kevin Bau paid his account if full shortly after the close of the semester. Brother Jason Adams graduated without paying his spring out of house fee. His balance remains $543. Brother Denzel Middleton has a balance of $1460 on his spring house bill. Apparently, he has had problems with his student loan. He had planned to reside in the house for the latter half of the summer. I sent him a letter advising him: (1) he could not do so; (2) he had been automatically suspended under The Law; and (3) that he could not return in the fall until his debt is paid in full. I sent his mother a similar letter. In both cases, I've asked the Office of Fraternity and Sorority Life to determine why, how, and when the financial holds on these accounts had apparently been removed. The only remaining account receivable is $178 for damages done by Brother Gabe Adorno, ΔΔ1426, during a visit to the House in the fall of 2010. Two letters sent to him have been unsuccessful in collecting this debt. This account receivable has been expensed as a bad debt. As discussed in previous annual reports, the alumni have expressed continued concerns over the cleanliness of the Chapter House. I'm pleased to report that cleanliness has significantly improved. Last fiscal year, I met with a local attorney, Bernie Cantorna. As discussed in last year's annual report, he instructed me on the eviction process for non-financial breaches of our lease. Mr. Cantorna also advised on some changes to our standard lease that will make collection of damages easier to obtain and enforce. I incorporated these changes in the housing contracts for 2012 – 2013. On September 23 and 24, 2011, the Chapter held a "toga party." The police identified several underage intoxicated individuals who had left the party. The police visited the Chapter early in the morning of the 24th and spoke with the Commander. The Chapter was later served a citation for serving alcohol to underage individuals. 5. Alumni oversight of risk reduction. After that time, the Collegiate Chapter worked diligently with the Chapter's Alumni Advisory Board to improve its plan for risk reduction and educate its members. A conference call with the Property Association Officers and Directors was held on February 23, 2012, to discuss concerns with the draft plan. The concerns were documented in a letter from me to the alumni officers and directors dated February 24, 2012. A revised Risk Reduction Policy and Guidelines Implementation Plan was later presented to the Property Association's Board of Directors for review and the Association's comments were incorporated. I signed the plan for the Association on March 13, 2012, and forwarded it to the Eminent Commander on the same date for his signature. Among other improvements, the new plan includes an improved degree of accountability and enforcement with the Collegiate Chapter and requires the Chapter to inform the Association in advance of all social functions so the Association can monitor those functions, if desired. During the spring semester, the association monitored one function and no issues were reported. In a letter dated March 22, 2012, we informed the General Fraternity of the new plan and recommended that the Chapter's social suspension be lifted and the Chapter's status be returned to good standing. In response to this letter and submission, the General Fraternity lifted the suspension on March 27, 2012. As a result of this incident, house bills for the spring semester 2012 were raised by $100/resident to cover anticipated legal costs and fines. In addition, the General Fraternity will charge the Chapter the highest risk management premiums for the 2012 – 2013 academic year. The net cost of this violation is expected to approach $8,000. For the upcoming academic year, the Association's planned activities include: a kick-off meeting with the Collegiate Chapter on Sunday, September 2 (Ohio game/Labor Day weekend); the annual Homecoming meeting on October 6 (beginning at 7:00 PM); a budgeting and planning meeting on January 26 (tentative); and a short meeting with the Collegiate Chapter, if needed, on Saturday of Blue/White weekend. Additional meetings and/or telephone conferences will be scheduled as needed. Brother Sidwell will continue to serve as our representative as our interface with the Centre Region Code Administration. The Association will host a buffet-style dinner following the Blue/White game on April 20, 2013. I retired from the U.S. Nuclear Regulatory Commission on April 30, 2012. We closed on the sale of our Virginia home on May 8, and moved the same day to our new home in The Village at Penn State. I've become more involved with the Chapter as a local resident, providing assistance to Ed Sidwell and undertaking some projects on my own. Hopefully, as a local, I can provide better oversight of social activities and assist Ed with Chapter House improvements. Planned repairs include new ventilation fans in the main bathrooms (fall semester), an assessment and repair, as needed, of the dishwasher (fall semester), and mortar repair of the upper five feet of the House Mother's Suite exterior wall (spring/summer). This mortar has deteriorated significantly due to water infiltration from the roof and repeated freeze-thaw cycles. Attachment 1 includes budget execution results for 2011 – 2012 and the budget for the 2012– 2013 fiscal year, which was approved by the Board of Directors in early June 2012. This new budget is an increase because some expenses have increased. 1. Rent charged to the Collegiate Chapter was increased by $1,000 because of the unplanned summer occupancy. A summer operation was not planned when the budget was prepared. 2. Capital improvements for 12 - 13 are budgeted to be modest until such time as a new capital improvement plan is reviewed and approved by the Board of Directors. 3. Affinity costs are associated with processing pledge reminders and donations and have increased significantly. 4. At the close of the fiscal year, our mortgage loan, executed in 2002 for a term of 15 years, had a balance of $22,370. Our other loan, refinanced in June of 2008 for a term of 15 years, had a balance of $59,456. Debt service on these loans totals $1,140 per month. 5. Real estate taxes were less than budgeted because rate increases were not as high as I had anticipated. The 12 – 13 budget is based on the current assessment and known tax rates. 6. Casualty insurance costs for 11 – 12 were consistent with the budget. 7. Liability insurance costs were less than budgeted because the actual rate ($147/member) was less than that assumed in preparing the budget ($260/member). Rates for 12 – 13 are based on the highest rates charged (Tier 3) to any chapter by the General Fraternity in 11 – 12 because of the risk violation that occurred as discussed above. We won't know the new rates until the fall semester begins. Costs for Maintenance/Repairs/Furnishing expenses far exceeded our budget, largely because of significant emergent repairs conducted in the fall which included soffit, gutters and fascia replacement, regrouting the third floor showers and a wide range of other repairs (details will be provided upon request). The bill for these fall repairs totaled over $7,000. As a result of these expenditures, I sought approval from the Board of Directors in June to exceed the limit of $15,000 established in the Association's Bylaws. By Board vote (with no dissents), the limit was raised for this fiscal year to $18,000. Miscellaneous expenses included Blue/White dinner, copies and related expenses for meetings, conference calls, postage, and classified ad costs for boarders. 10. The negative net cash flow is the cumulative result of the variances discussed above. The year-end balance sheet is provided as Attachment 2. Our "Current Assets" have increased since last year ($129,287 on 6/30/12 v. $120,976 on 6/30/11) as a result of donations to the capital campaign. The Association has loaned funds to the Alumni Chapter to cover shortfalls in donations to the Annual Fund. The first loan occurred in 2006 for $1000. Loans for 10 - 11 totaled $4,700 with a total debt of $5,700 at the end of that year. A loan was not required this year and no loan payments were made. Under Liabilities & Equity, the "Deferred House Mothers Suite" (HMS) account represents the funds that had been raised by Brother Leyburn, ΔΔ 597, and ear-marked for the HMS renovation. The "Nittany Bank Loan" is the combined remaining principal of the two loans discussed above. Beginning in the 2007 – 2008 fiscal year, the Association transferred the management of security deposits from the Collegiate Chapter. Thus, the Association's balance sheet includes asset and liability entries that should offset. They don't & I'm trying to resolve. Brother Ed Sidwell has consistently supported all aspects of our operation, only some of which are described above. Brother Doug Kosydar, ΔΔ1249, has been the Alumni Chapter's Worthy Commander, a member of the Association's Board of Directors, and a member of the AAB. Director Brandon Peterson, ΔΔ1306, has also served as Chairman of the AAB and Brother John O'Donnell, ΔΔ869, is the Chapter's faculty advisor. Finally, I thank all the officers, directors, and advisors for their support throughout the year. As always, I would appreciate any feedback on how we can improve the Association's operations. We are very fortunate as an organization to have such a dedicated group of Active Chapter Brothers when it comes to their academic performance. "Based on Sigma Nu Fraternity, Inc.'s Risk Reduction Policy and Guidelines, the presence of alcohol within the chapter facility is tied directly to a chapter's performance in the areas of academics, attendance at General Fraternity conclaves, as well as the chapter's adherence to state laws and college or university policies. (on a 4.0 scale), whichever is lowest, shall be placed on academic warning for the next academic term in order to allow for the chapter to raise its GPA to be at or above the applicable GPA. Should the chapter fail to raise its GPA to the applicable average while on academic warning, the chapter shall not be allowed to have any alcohol on chapter premises for as long as the condition exists. Listed below you will find a status report based on the most up-to-date information we have regarding your chapter. If you believe any of this information is incorrect, please contact us immediately to report the correct information." We had our annual Planning & Budgeting Meeting today. Two significant and possibly history making results. First the Chapter projects a full house of 45 resident brothers and 9 out of house for next fall. Yes, a FULL HOUSE! Second, it appears that the Chapter has decided on an in-house cook operation for next year. They are checking out sources, but, according to the EC, the decision has been made. Once the Chapter selects the food vendor/cook, the Association will work out the contract details and revise the budget to include meal costs. A heads-up to the Association Directors - The Chapter will likely request normal dinnerware for the evening meal & use disposables for lunch. Thus, the Association will need to invest in china, glassware, & flatware. Pots & pans will be needed if cooking is done on site. In addition, we'll need to invest in a new dishwasher..I have an estimate for the latter but not the former. I expect our needed investment to range in the order of $8 - 10K. The stainless steel cabinets will need a thorough scrub to remove rust & accumulated dirt. Your vote on all of this will be solicited after a final decision is made & I've consulted with the vendor & Nittany Co-Op regarding the needed upgrades. More as I Iearn more. Finally, the Chapter will be voting as early as tonight on using a portion of its cash reserves to replace the tile floor in the north party room. I expect a positive vote. The estimate for this work is $4705., including removal of existing tile floor (non-asbestos), floor levelling, installation of new VCT floor, Sigma Nu insert, and new cove base. This is in line with the other floor work that was done. Not sure if this can be done over spring break. If not, we'll perform during the summer. I'm very impressed with this group. The Active Chapter has been working hard with their efforts for THON and they will be partnering with Vole, the Penn State Ballet Club. The Chapter has stepped up their game yet again and adopted a THON family, the Nolt family, this year and will be dancing for a 13 year old girl who is battling cancer. I am saddened to announce the passing of Brother Hank Garfield ΔΔ868. Hank lost his battle with cancer on November 9th, 2012. Hank was a great man and I am glad that I had the chance to meet him several times while I have been serving as our Alumni Commander. I am saddened to report the loss of Brother Robert L. Merker, '43 ΔΔ417 on 1/26/12. He was a retired Sr fellow with the Mellon Institute. I am saddened to report the passing of Brother Art Crum ΔΔ667 on to the Chapter Eternal on November 12, 2012. Please keep his family in your thoughts and prayers as they continue to heal. Active Chapter has Best RUSH ever! The Active Chapter has done a tremendous job with RUSH for the Fall 2012 semester as they have officially registered a candidate class of 28. 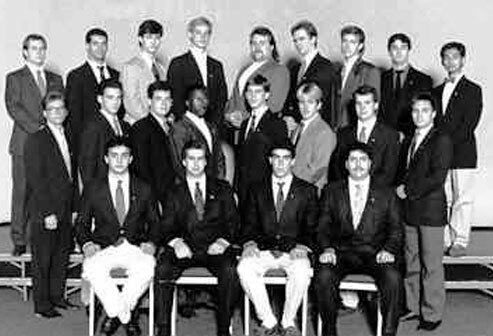 I am not 100% certain but am fairly sure that the Delta Delta Chapter has not had a class of young men beginning their journey in the Legion of Honor this big in our history. If you are in State College this fall, be sure to make it a point to stop by the house to see all of our recent upgrades, thanks to those Brothers that donated to our Building a New Legacy Capital Campaign, as well as meet some of these fine candidates. Andy Moore Tree Surgeon took down one of our four remaining elm trees today. but sure sad to see it go! The University has completed the sidewalk upgrades surrounding our Chapter House. Thanks to Ed Sidwell for his fine photography skills! According to the Gazette article, the survey,"... is seeking a thoughtful assessment of the road ahead from people who care about rebuilding the Penn State and local communities... from key stakeholders, including Penn State alumni, students, parents, and faculty; local residents, business owners and employers; and Penn State fans and visitors to Happy Valley." The survey can be found at http://www.affinityconnection.com/PSU-survey. The Property Association recently purchased a new industrial refrigerator at an extremely large discount from the Fraternity that was living in the old Phi Delta Theta house. There are also discussions with the Board of Directors with moving forward to purchase a new Industrial stove as well as replacing the windows on the second and third floors. Things are definitely moving in the right direction with our Chapter as we are truly recruiting young men of high character that are wanting to live our ideals while treating the property with the respect that it deserves. I would encourage all alumi to stop by the house the next time they are in town. Thanks again to Bob Nelson and Ed Sidwell for leading the Property Association as well as our Board of Directors for serving in their Leadership roles. Thanks also goes to those Brothers that have contributed to our recent Capital Campaign. I would encourage all Brothers to please honor their pledges so that we can continue to make the needed upgrades to the Chapter house for all Brothers to enjoy for years to come.